The Crisis of Energy and Money in a Post Peak Oil World, Michael C. Ruppert, Chelsea Green. “The coming energy crisis will be a crisis as great as any we have ever faced as a nation,” writes Michael Ruppert in “Confronting Collapse,” in which the author — in no uncertain terms — predicts the end of the Age of Oil and explains the repercussions of this potentially devastating development. 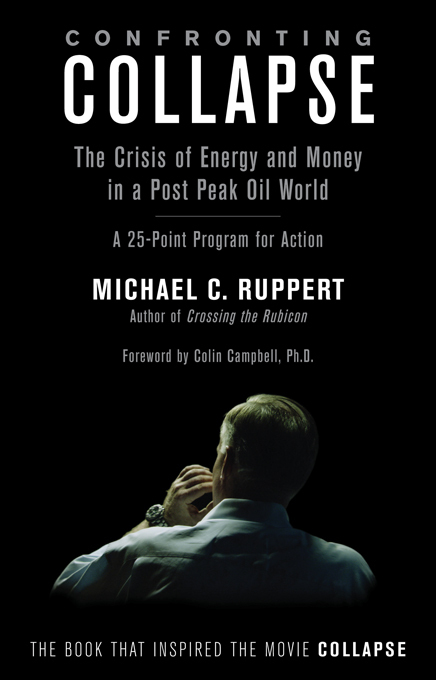 Originally self-published under the title “A Presidential Energy Policy: Twenty-five Points Addressing the Siamese Twins of Energy and Money” (2008), Ruppert’s work inspired the documentary film Collapse, which in turn prompted Chelsea Green Publishing to republish his manuscript with little more than topical updates. Ruppert, a former Los Angeles Police Department narcotics investigator turned investigative journalist, argues that despite media assertions to the contrary, the world’s crude oil output has already peaked, and that unless we break our worldwide addiction to oil, future energy shortages and price spikes will trigger an economic collapse. He goes on to set forth a wide-ranging 25-point plan intended to forestall and mitigate the damage of an energy crisis, yet he doesn’t prescribe how to overcome political inertia and exceedingly powerful energy interests. Not surprisingly, many of the elements of Ruppert’s plan would be very controversial — enacting and enforcing a 55-mph speed limit nationwide, for instance, as well as decriminalizing marijuana and encouraging widespread production of hemp, “which [would] enable a limited amount of biodiesel production as fuel shortages grow worse,” he explains. The bottom line, though, is that one needn’t agree with the premise or Ruppert’s 25-point plan to derive benefit from “Confronting Collapse.” The value of the book is in its thought-provoking outlook, which contrasts sharply with the messaging of our corporate media. In short, Ruppert predicts that before the end of the year 2010, we’ll experience energy price spikes that will choke off the economic turnaround and lead to financial meltdown.